"Troubling laboratory tests suggest some nanoscale particles may pose novel health risks by, for instance, slipping easily past barriers to the brain that keep larger particles out." What if the candy maker Mars could come up with an additive to the coating of its M&M’s and Skittles that would keep them fresher longer and inhibit melting? Or if scientists at Unilever could shrink the fat particles (and thereby the calories) in premium ice cream without sacrificing its taste and feel? These ideas are still laboratory dreams. The common thread in these research projects and in product development at many other food companies is nanotechnology, the name for a growing number of techniques for manipulating matter in dimensions as small as single molecules. Food companies remain wary of pushing the technology — which is named for the nanometer, or a billionth of a meter — too far and too fast for safety-conscious consumers. But they are tantalized by nanotechnology’s capacity to create valuable and sometimes novel forms of everyday substances, like food ingredients and packaging materials, simply by reducing them to sizes that once seemed unimaginable. Most of the hoopla and a lot of the promise for nanotechnology lies in other industries, including electronics, energy and medicine. But the first generation of nanotechnology-based food industry products, including synthetic food colorings, frying oil preservatives and packaging coated with antimicrobial agents, has quietly entered the market. The commercial uses of the technology now add up to a $410 million sliver of the $3 trillion global food market, according to Cientifica, a British market research firm that specializes in nanotechnology coverage. Cientifica forecasts that nanotechnology’s share will grow to $5.8 billion by 2012, as other uses for it are developed. Mindful of the adverse reaction from some consumers over the introduction of genetically engineered crops, the food industry hopes regulators will come up with supportive guidelines that will also allay consumers’ fears. That has put a spotlight on the Food and Drug Administration’s first public hearing today on how it should regulate nanotechnology, with a portion of the agenda specifically about food and food additives. No policy changes are expected this year. “To their credit, the F.D.A. is trying to get a handle on what’s out there,” said Michael K. Hansen, senior scientist at Consumers Union, one of 30 groups that have signed up to speak at the meeting. But coping with nanotechnology will be a daunting challenge for the agency, according to a report last week by a former senior F.D.A. official, whose analysis was sponsored by the Pew Charitable Trusts and the Woodrow Wilson International Center for Scholars, a Washington policy group. Michael R. Taylor, a former deputy commissioner for policy at the agency, said the F.D.A. lacked the resources and, in the case of cosmetics, dietary supplements and food, the full legal authority needed to protect consumers and also foster innovation. Industry representatives and analysts are worried that nanotechnology will suffer the same fate as genetic engineering, which was quickly embraced as a breakthrough for drug makers but has been fiercely opposed, especially in Europe, when used in crops, fish and livestock. Many of the same groups fighting genetic engineering in agriculture have been arguing for regulators to clamp down on nanotechnology, in general, and its use in food and cosmetics, in particular, until more safety testing has been completed. So far, there have been no confirmed reports of public health or environmental problems related to nanotechnology. But troubling laboratory tests suggest some nanoscale particles may pose novel health risks by, for instance, slipping easily past barriers to the brain that keep larger particles out. Thus, the same attributes that could make the technology valuable for delivering drugs could also make it hazardous. More important, everyone agrees that there have been few rigorous studies of the actual behavior of the newly engineered nanoscale materials in humans and the environment. Those that have been completed fall far short of duplicating the range of conditions the nanoparticles would encounter in general commerce. And few laboratory studies have focused on the fate of particles that are eaten rather than inhaled or injected. “Lack of evidence of harm should not be a proxy for reasonable certainty of safety,” the Consumers Union said in testimony submitted to the F.D.A. for today’s meeting. The language was carefully chosen. “Reasonable certainty of safety” is what food companies must demonstrate to the F.D.A. before they can introduce a new food additive. The Consumers Union and some other groups are suggesting that the agency automatically classify all new nanoscale food ingredients, including those now classified as safe in larger sizes, as new additives. And they want the same standards extended to cover food supplement companies, some of which have been marketing traditional herbal and mineral therapies in what they say are new nanoscale forms that increase their effectiveness. Some are also calling for mandatory labeling of products with synthetic nanoscale ingredients, no matter how small the quantity. F.D.A. officials said last week that treating every new nanotechnology product that consumers swallow as a food additive might compromise the agency’s mandate to foster innovation and might not be within its authority. Such a move would also be hobbled by the lack of agreement on safety testing standards for the wide range of nanoscale innovations in the pipeline. In addition, the agency lacks the staff to handle that scale of oversight. “That would be a sea change for us,” said Laura Tarantino, director of the F.D.A.’s Office of Food Additive Safety. Simply defining nanotechnology may also be a hurdle. 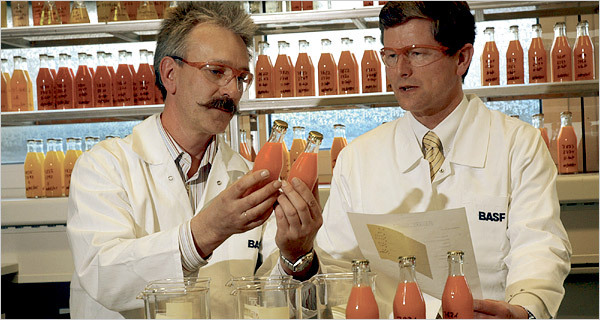 BASF has been widely considered a pioneer for products like its synthetic lycopene, an additive that substitutes for the natural lycopene extracted from tomatoes and other fruits. Lycopene, widely used as a food coloring, is increasingly valued for its reported heart and anticancer benefits. But BASF’s particles average 200 to 400 nanometers in diameter, about the same as the natural pigment, and well above the 100-nanometer threshold that many experts consider true nanotechnology. Unilever has never disclosed the dimensions of its shrunken fat particles. Trevor Gorin, a Unilever spokesman in Britain, said in an e-mail message that reports about the project have been misleading. Given the uncertainty about the risks of consuming new nano products, many analysts expect near-term investment to focus on novel food processing and packaging technology. That is the niche targeted by Sunny Oh, whose start-up company, OilFresh, based in Sunnyvale, Calif., is marketing a novel device to keep frying oil fresh. OilFresh grinds zeolite, a mineral, into tiny beads averaging 20 nanometers across and coats them with an undisclosed material. Packed into a shelf inside the fryer, the beads interfere with chemical processes that break down the oil or form hydrocarbon clusters, Mr. Oh says. As a result, restaurants can use oil longer and transfer heat to food at lower temperatures, although they still need traditional filters to remove food waste from the oil. Mr. Oh said OilFresh will move beyond restaurants into food processing by the end of the month, when it delivers a 1,000-ton version of the device to a “midsized potato chip company” that he said did not want to be identified. The desire to avoid controversy has made even the largest food companies, like Kraft Foods, leery about discussing their interest in nanotechnology. Kraft, the second-largest food processor after Nestlé, was considered the industry’s nanotechnology pacesetter in 2000. That is when it announced the founding of an international alliance of academic researchers and experts at government labs to pursue basic research in nanotechnology sponsored by Kraft. The Nanotek Consortium, as Kraft called the group, produced a number of patents for the company, but Kraft pulled back from its high-profile connection with nanotechnology two years ago. Manuel Marquez, the research chemist Kraft appointed to organize the consortium, moved to Philip Morris USA, a sister subsidiary of Altria that now sponsors the consortium under a new name — the Interdisciplinary Network of Emerging Science and Technologies. Kraft still sends researchers to industry conferences to make what it calls “generic” presentations about the potential uses of nanotechnology in the food industry. But the company declines to specify its use of or plans for the technology. F.D.A. officials say companies like Kraft are voluntarily but privately providing them with information about their activities. But many independent analysts say the level of disclosure to date falls far short of what will be needed to create public confidence. “Most of the information is in companies and very little is published,” said Jennifer Kuzma, an associate director of the Center for Science, Technology, and Public Policy at the University of Minnesota, who has been tracking reports of nanotechnology use in food and agriculture.